I am delighted to share our experience of Living Wisdom School (LWS). As an educator in the field of early learning at Stanford University, I know that the future of our society depends on its ability to foster healthy development in the next generation. Extensive research on the biology of stress, conducted at the Center for the Developing Child at Harvard University, shows that healthy development can be derailed by excessive or prolonged activation of the stress-response systems of a child’s body and brain. 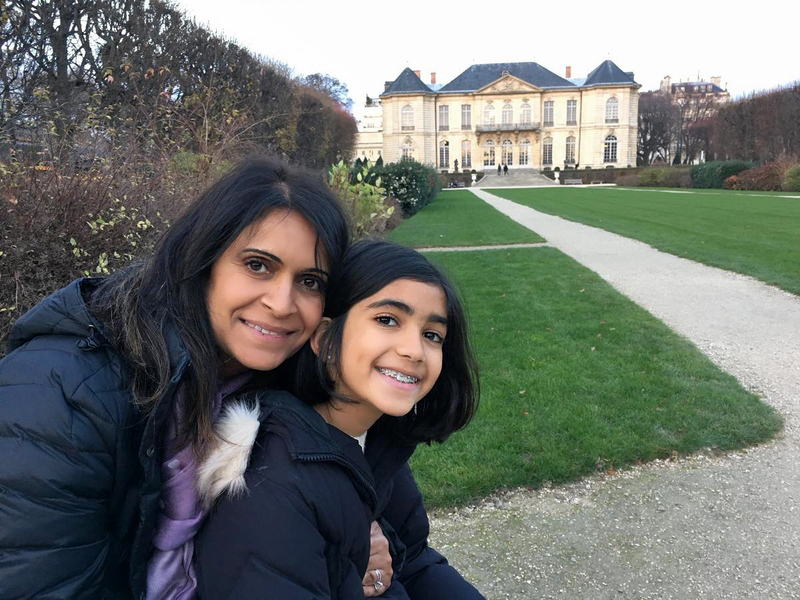 Raju Parikh with her daughter, Raeva, in front of Auguste Rodin’s home during a 2015 trip to Paris. Click to enlarge. Toxic stress can have damaging effects on learning, behavior, and health. Thus, learning to cope with adversity is an important part of any child’s healthy development. The Harvard researchers found that when a young child’s stress-response systems are activated within an environment of supportive relationships with adults, these physiological effects are buffered and brought back down to baseline. As parents, we understand that we cannot save our children from life’s stressors. Having acknowledged this, the pressing issue for our family became how to provide our daughter with an environment that would nurture her spirit, her mind, and her soul. In 2011, my husband and I came across Living Wisdom School’s website, after reading Autobiography of a Yogi and doing some research on meditation and spiritual living. The seed was planted for our family’s association with LWS, which would become an inspiring adventure for our daughter and our entire family. Why did we choose LWS? 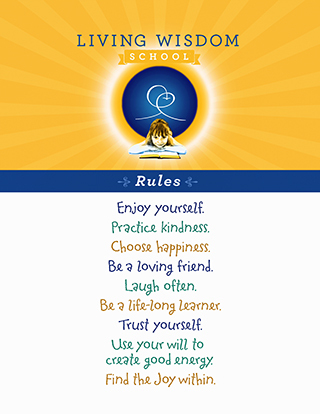 LWS is a rare environment where the founders have created a holistic approach to academic education that includes mindfulness and positive thinking, and where the teachers guide the children daily in consciously choosing kindness, joy, and happiness, with an emphasis on universal human values that nurture their strengths and positively reinforce their innate love of learning. Raeva (r) and a friend cooperate on an assignment. Academics that provide our daughter with the skills she will need for her life’s work. Self-regulating skills such as meditation, deep breathing, and yoga, and an emphasis on teaching kindness and joy as paths to understand and cope with this complex, changing world. Helping children develop a mindset of choosing happiness even in adverse circumstances, with a strong focus on emotional self-regulation. Confidence development through healthy competition in an environment of mutual support and discovery, to help our daughter understand that excellence is an important goal to strive for in all facets of her life, while experiencing satisfaction in the process. Mindfulness practice, which research has shown decreases stress and anxiety, increases attention, improves interpersonal relationships, and strengthens compassion. 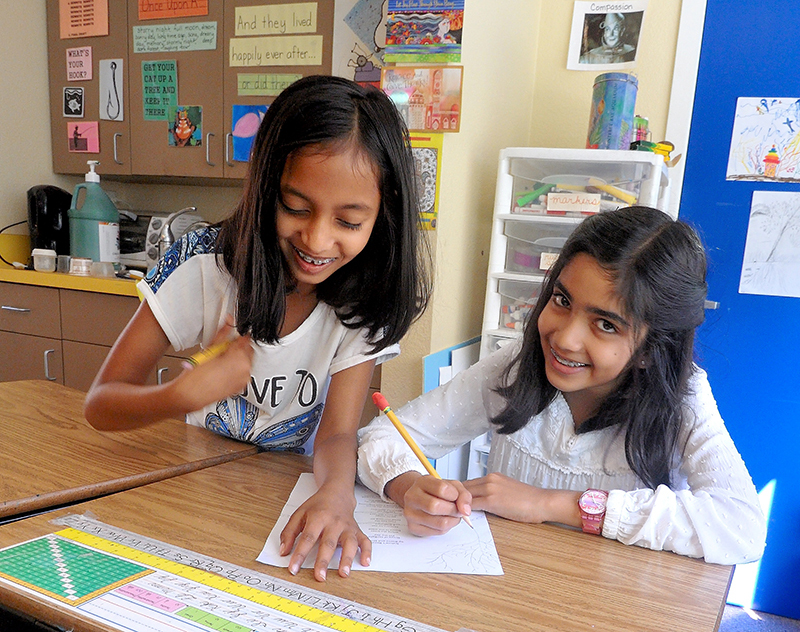 Constant personal attention from teachers who devote tremendous energy to understanding each child’s unique strengths and weaknesses. Teachers who are given the freedom and flexibility to adapt and refine the curriculum to challenge and support our daughter in achieving at her own, individual pace. A caring, nurturing community of children, parents, and teachers who are working toward the common good for the children, their families, and the world. The annual Theater Magic program that engages the entire student body, and enhances academic learning in ways that we cannot begin to adequately describe. Our daughter’s experience at LWS has been a blessing both for her and for our family. She is eager to go to school every day and loves her school environment. I cannot think of a better definition of school success. Finally, it has given us joy to come to a deeper understanding of Education for Life over the years, because it has extended into our family and helped us consciously define our goal of authentic parenting. Our daughter is progressing well in her academic environment, as she learns to manage her stress, choose happiness, and be a joy-filled child. What more could we ask? Raju Parikh is the Director of Early Learning Programs at Stanford University. My two children have attended Living Wisdom School for the last seven years. Before we discovered LWS, they were enrolled in four separate schools, and while each school had its merits, we never felt that they were completely right for us. At LWS, I know without the slightest doubt that my children will be loved, taught, challenged, and nurtured every day – and what more could a parent ask? The richness of the LWS Education for Life (EFL) philosophy arises from a deep, consistent valuing of the unique and special qualities of each child’s mind, heart, hands, and soul. As an education researcher, I’ve studied human development and learning from a cognitive and social perspective, absent the key dimension of the soul (in the most expansive sense of the term). When I first became acquainted with LWS, I felt that my academic background would surely prepare me to understand Education for Life. I dutifully read the Education for Life book and tried to assimilate its ideas into my own thinking and the frameworks that I had studied in graduate school. But there were problems with that approach. EFL is so much more than an abstract system that I could absorb and intellectualize with my rational mind. I read the book several times and could scarcely decipher its meaning, thanks to the theoretical prejudices that my education and experience had fostered. But as the years passed, and I began to understand EFL in greater depth, I realized that it can only be truly studied and evaluated in the living arena of the child’s daily experiences in the classroom and playground. I watched with wonder as both of my children began to thrive under this approach, and I was thrilled to see how their growth was positively reflected in key moments of our journey as a family. 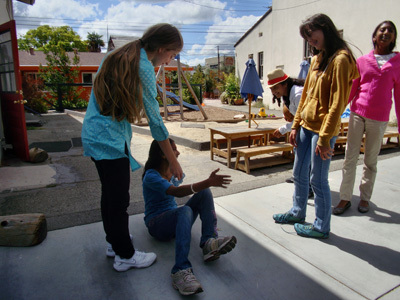 I’ve been deeply impressed by the many ways our children’s consciousness and learning have expanded through their participation in the yearly all-school Theater Magic play, the literary journal, the spring art show, the music concerts, and the various culturally inclusive celebrations and field trips across the school year. Whenever my son has experienced obstacles in his academic subjects, his teachers have had the freedom and flexibility to give him all the help he needed, and to adapt the curriculum and the teaching approach to meet his unique needs. Throughout my years of observing the LWS teachers, I’ve been gratified to see how much energy they bring to noticing and valuing the gifts that each child brings. An LWS teacher told me that my son always played a key role in initiating and sustaining deep class discussions about the subject matter, and that he offered stimulating perspectives that advanced learning for everyone – and this was in fourth grade! It was typical of the feedback I receive in parent-teacher conferences, and on report cards (which are ungraded, because the richness of the students’ learning at LWS cannot be reduced to a simple percentage or letter grade). My children have very different personalities, yet they have both found LWS to be a place of adventure, friendship, and safety, free from the anxieties and undue pressures associated with many other schools, especially “high-performing” schools. My daughter has experienced tremendous acceptance and love throughout her journey at LWS. The school has fostered her identity as an artist, as a primary medium through which she expresses herself. At the end-of-year ceremony, I was so proud to watch her give her speech about the quality that the teachers had observed in her over the preceding year. I held my breath when it was her turn to celebrate her quality. But like all the LWS children, she gave her short speech with complete confidence to an audience of over 200 students, teachers, parents, and relatives. She was able to show such poise because she believed in what she was saying, and she knew that she was surrounded by a community of friends who were cheering her on. Our experience of LWS has given me confidence that I am fulfilling my sacred duty as a parent to give my children an education of the highest possible quality; an education that will not only set them on a positive path to college and career, but will help them know that they have the power to choose happiness wherever they go. The joy and wisdom that have unfolded for my children and my family through the LWS community are boundless. Jack Dieckmann serves as Director of Research at youcubed at Stanford University, a nationally recognized initiative for inspiring, educating, and empowering teachers of mathematics by transforming the latest research on math learning into accessible and practical forms. Prior to joining youcubed, he was Associate Director for Curriculum at the Stanford Center for Assessment, Learning, and Equity (SCALE), where he led the math team in performance assessment development. He received his doctorate in math education at Stanford in 2009. 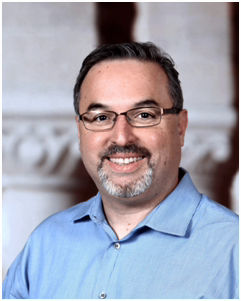 For the past 12 years, Jack has served as an adjunct faculty member in the Stanford Teacher Education Program (STEP). Children develop self-confidence through kindness and supportive guidance. An excellent academic program, combined with attention to the individual child’s emotional needs, fosters exceptional and joyful learning. 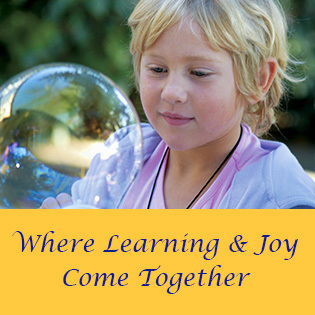 Will your child be happy and successful at Living Wisdom School and beyond? Listen to what our parents and graduates say. Peter: Hi, Helen. I just wanted to call and say thank you. Peter: I just received my acceptance to Stanford, and I know it would never have happened without you guys. Seriously, without LWS this never would have happened. “I am writing to say thank you. You taught me many things in my two years at Living Wisdom, but the most important, by far, was how to use common sense. In the theater business (and, frankly, in any business), there is always a delicate balance between doing what you’re told and acting instantly upon your own judgment. We memorize our lines and blocking, but if something goes wrong, we have to ad lib…we have to think on our feet and act accordingly. I owe my ability to do these things almost entirely to you, and for that I am most grateful.” Rose Frazier, Class of ‘06, is at the San Francisco Conservatory of Music, sings in the San Francisco Opera Chorus, and performs with the Gilbert and Sullivan Lamplighters. “When I was at Living Wisdom, I never really understood what you and the school were doing for me, and how incredibly fortunate I was to be in that situation. Looking back, I can see how much I took the entire thing for granted, your teaching style, the philosophy of the school, and the whole environment that surrounded it. In a way I think I really didn’t take advantage of all the help you were trying to give me, but even through all the troubles I gave you (even though they were all somebody else’s fault! ), you managed to impart upon me the secrets of life, and indeed, the universe itself! “In all seriousness though, it is especially easy for me to notice the difference in myself now because I am surrounded by people who are still in the state of mind that I was in when I came to Living Wisdom. Now, that’s not to say I don’t get in trouble anymore, or that I am a perfect child or anything (I am), but the way I view the world around me and other people in it has changed dramatically. Where other people are teasing or making fun of somebody in a joking way, I can really easily tell how that person is feeling about it, even more than just the seeing the look on their face. “I can tell if they are not finding it funny, or they are actually hurt by it, even if they are acting as if they are fine. It doesn’t sound like much, but none of my friends understand when something like that is happening, and when I talk to them about it, they will look confused and say that they had no idea, or that they didn’t mean for it to be hurting the person. And I believe them. I don’t think they were doing it on purpose or anything, but it just shows that for some reason I am more aware about other people and my surroundings than most of the kids my age. “It shows itself in other ways too, but that is the most obvious at least to me. “St Stephen’s strives for excellence in the arts, athletics, and academics. Of course, with everything there is to do at school, I am challenged and busy. The teachers are fun and encouraging. I have slowly started making friends. Friendships take time to occur. Unlike at Living Wisdom School, it has taken a long time to meet people who easily accept you. Through my short experience at St. Stephen’s, I have realized what an incredible learning environment was provided at Living Wisdom School. Going to school at LWS was like going to your extended family everyday.” Elliot Sakatch, Class of ‘05; Elliot moved to Austin, Texas with his family and enrolled at St. Stephen’s Episcopal School. “Gary (LWS middle-school teacher Gary McSweeney) says he honestly believes LWS students have successful interviews for high school, talk more easily in public, and relate more readily to adults because of the Living Wisdom Theater program. He knows firsthand because he has seen a huge transformation in his son, Bryan, who attended LWS from Kindergarten through 8th grade. “Sinead scored exactly 1500 out of 1600 on the SAT for Math and English. The SAT now has three parts, and out of a total of 2400, she scored 2150. She had a perfect score on the PSAT in Math. She has also been recommended for enrollment as a National Merit Scholar and has a four-point GPA. Rose Frazier, Class of ’05, attended high school at The Bay School in San Francisco. Although accepted by Stanford University, Rose chose to enroll at the San Francisco Conservatory of Music. Catching up with Peter Abrams, Class of ‘04, at Herbst Theater in San Francisco. Peter has maintained a 4.0 GPA throughout high school. As a freshman, he received the achievement award in both his Algebra and English class. As a sophomore, he repeated that accomplishment in Math and Japanese. His natural athletic talent and great work ethic paid off in sports as well. He was slated to play for the varsity baseball team in spring, having overcome an earlier football injury. Eric Munro’s two boys attended LWS from kindergarten through eighth grade. Eric tells how inclusiveness training at LWS helped his sons. Eric graduated in electrical engineering from MIT and has served as an LWS math and science teacher and math volunteer. At the annual LWS family campout, I sat by the campfire and watched my older son play. Zachary was playing with the younger kids, giving them piggyback rides. Although I felt some natural parental pride, it quickly turned to gratitude for our school. I knew that Zachary’s wonderful expansive heart wasn’t solely to my parenting. I knew it came most powerfully from the eight years he spent in the school. 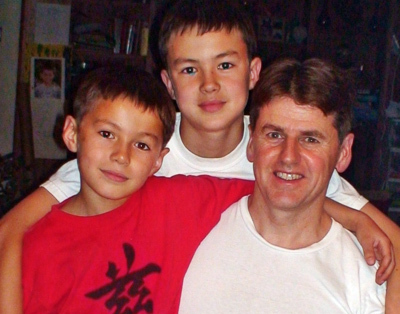 Ever since my sons entered LWS, I’ve been aware that one of the most important influences on our sons was how it developed their sense of inclusiveness. As parents, it made our lives a lot easier, and I’m sure it will help them in high school, college, and adult life. Starting in Kindergarten, the children at LWS learn to play and work together. They learn that it just feels better to include others and not exclude anyone who wants to play. The remarkable part is that these “rules” aren’t enforced in the school as rigid principles to be obeyed under threat of punishment. On the contrary, the teachers help the children be aware that they are happiest when they expand their hearts to include others. Three of the LWS “School Rules” lay it out Practice Kindness. Be a loving friend. Use your will to create good energy. How do the kids learn to practice these important life principles naturally, without adult reminders? Affirming the rules in the classroom is the first step. But it makes a much bigger impact that the teachers model the rules constantly. I’ve recently served as a volunteer during snack and lunch breaks. I was aware at second hand of the inclusiveness and conflict resolution training the children receive, but seeing it in action is amazing. During snack period one day, two kindergarten girls got into a disagreement. When the teacher saw that one girl was crying, she sent all of the other kids to another teacher’s class and spent ten minutes leading the girls through a conflict resolution. First, she had them take turns talking about what happened, and how they felt. As they talked, she made sure they looked into each other’s eyes. Later in the day, I visited a public library where several small children were playing outside. Some of the kids were arguing, and one child was crying. The teacher walked over and said, “Be nice to your friends,” and then she walked away. I thought, “What a difference!” It struck me that it was bound to affect their future development, their personalities, and the adults they would ultimately become. No amount of training can turn a person into a saint. But from my experience of having been a child, adult, and parent, I’m struck by how much happier a child will be by receiving this training in awareness of others. I’m struck also by how much more ably they’ll relate to others as adults, thanks to the constant, active guidance of the teachers at LWS. You can see it every day on the playground, particularly among the children who’d been at LWS for several years. This tells me that the LWS experience deepens that quality in them. An older child lifts a young one to help him shoot a basket. The older kids giving the younger kids extra turns so they won’t be knocked out of a ballgame. Throughout the school, there’s a pervading awareness of other people’s realities, and of the joy of helping. 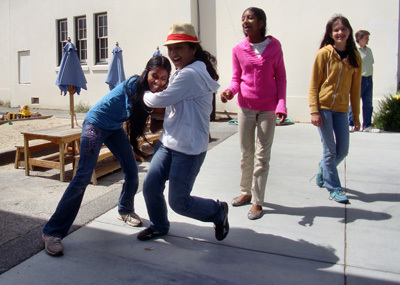 Shubha tries to take the ball away, middle schoolers at recess, Living Wisdom School. No teacher was present and guiding the conversation. It was just one of countless “wow!” moments I’ve had at LWS. My first wow happened when my older son was in second grade. His brother was in kindergarten, and my wife helped them make thank-you cards for their teachers. She suggested they tell the teacher something they were thankful for. …and Mariah lends a helping hand. Inclusiveness means being aware of other people’s realities. Zachary thought for a moment and said, “Thank you for helping us work out our problems on the playground.” My younger son dictated the same message. I was stunned. At a daycare camp the previous summer, my older son had gotten into fights on the playground. As punishment, the teachers made him sit on the bench at lunch. There was no instruction, no discussion, no individual guidance. It’s questionable if anything was learned. The LWS teachers are committed not only to changing behaviors but to helping children develop a more expansive outlook. And they’re able to actually do it, day in, day out, because the teacher-student ratio is low. From my experience as an LWS parent, I believe it’s a tragic misconception of what it means for a child to attain true maturity. Parents don’t realize that the ability to “play nice” demands character and inner strength. It’s much easier to retreat into selfish behavior than to exert self-control and extend one’s awareness to include the other person’s point of view. The inclusiveness training here at LWS makes a child strong. It gives them the ability to take positive action in the face of upset and negative emotions, a skill that many adults lack. It gives them, in fact, the maturity to be successful in life. The most successful people in the workforce are those who can keep working positively despite upsets and setbacks, and who can work well with others and motivate people to work well together. The children at LWS begin learning these lessons very actively at age five! Thus they become an integral part of who they are and how they behave. Instead of than becoming weak or “soft,” these children acquire strengths that will give them a competitive edge over young people who only receive a traditional, academically focused education that’s conducted precariously in a “tough” environment. “Confidence stances” before their classmates (younger grades). Learning the school rules and discussing them in class. Circle time (includes songs and chanting). Ongoing group projects in the classroom. Presenting projects before the class. The annual all-school Theater Magic production – a professional-quality event, performed to standing-room-only audiences, where every student in the school has a role. The year-end speeches deserve special mention. Every student receives an award for a “quality” they’ve worked on during the year. The student speaks to an audience of several hundred parents, siblings, and fellow students, explaining what the quality means to them personally. The most important character-building element at LWS is the teachers who are deliberately chosen and trained to serve as worthy role models for what it means to be mature, well-adjusted, and happy. Every one of these “tools and techniques of maturity” has a profound effect on the child, because they are applied consistently, daily, in the classroom, at recess, and during field trips and sports, in a natural way. When I think of the incredible gifts my kids received at LWS, I confess to feeling not a little jealous. I’m sure I would have enjoyed a happier childhood, found greater fulfillment as an adult, and been better able to understand and meet life’s challenges if I had attended LWS. I believe that enrolling your child in LWS is the wisest, most valuable gift you can give them, for their school years and beyond.